Jason Cohen is a Pittsburgh-based real estate investor with over a decade of experience in his field. Cohen firmly believes in the value of research prior to investment, and took a considerable amount of time to research the risk and rewards inherent in the Amazon deal. Below, Jason Cohen outlines his findings. How far would your home city go to attract Amazon’s attention? In August, the tech giant announced its intention to build a second headquarters in North America, prompting a deluge of enticements and bargains – some tinged with more than a little desperation. One tiny city in Georgia even went so far as to offer to change its name to Amazon if it was chosen. Bargains like these seem absurd, but it’s easy enough to see why prospective HQ2 cities would go to such lengths to attract attention. The tech giant promises to invest $5 billion in its satellite facility, and bring with it over 5,000 high-paying jobs. As Steve Glickman, cofounder and executive director of the Economic Innovation Group, puts it in an article for CNNMoney, winning the bid for HQ2 is akin to “winning the lottery […] [it’s] an event you can’t duplicate any other way.” With over 230 cities vying for placement, catching Amazon’s interest is a long shot – but some economic analysts think that Pittsburgh, PA has a solid chance of being the company’s next home. Currently, Pittsburgh ranks in the #5 spot in Moody Analytics‘ list of top contenders. The Forbes-recognized analytical firm took factors such as business environment, available human capital, transportation availability, quality of life, and the cost of doing business when making their considerations. According to their report, Amazon’s ideal satellite site would offer a bargain tax package and affordable land, as well as a supply of workers and the means to support them via transportation and housing. Pittsburgh itself stands above its competition as an already-burgeoning tech hub and thriving city center. It also has the advantage of being within several Amazon executives’ home state;CFO Brian Olavsky, for example, is from Hershey, PA. The city declared its candidacy as many cities did: via a cheery video offering Amazon a home within its borders. Given the immense potential investment and promise for unheard-of levels of economic growth, every city wants to snag Amazon’s HQ2. 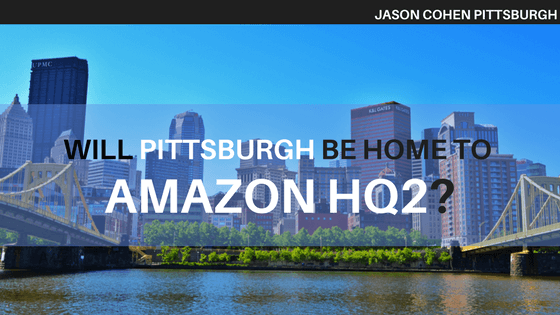 But as a whole, real estate investment advisors within Jason Cohen Pittsburgh are hesitant to leap onto the pro-Amazon wagon. In the promise of incipient wealth, many cities have overlooked the glaring problems that will accompany the company’s second site. For a glimpse of what might come if Amazon sets its roots in Pittsburgh, one only has to look to California. On the west coast, tech companies have sparked massive growth in city economies – and dramatic housing shortages. Affordable apartments are hard to come by in cities like LA, where a 2-bedroom apartment can cost over $4,000 per month in rent, nearly twice the national average. Even the best deals come with a catch – and Amazon’s too-good-to-be-true promise of investment is no exception. Amazon hasn’t chosen a location for its second home yet, and its deliberations have become a constant topic of speculation. But perhaps the question should be turned on its head; rather than asking, “What city will Amazon choose,” we should wonder “Will our city accept Amazon?” In the glitz and glam of potential growth, cities have forgotten the high housing cost the company will unwittingly place on Pittsburgh’s current citizens. Amazon’s deal is built with fool’s gold – and those at Jason Cohen Pittsburgh urge those in the city to consider the risks before leaping at its potential rewards.